Ara Vella, Tezcatlip0ca Bisiani and I went to the opening of Through the Virtual Looking Glass, a mixed reality exhibition being held at UMASS Boston’s Harbor Gallery. UMASS sits on Columbia Point, where the Puritans alit, and is the site of one of the earliest railroads in the country. 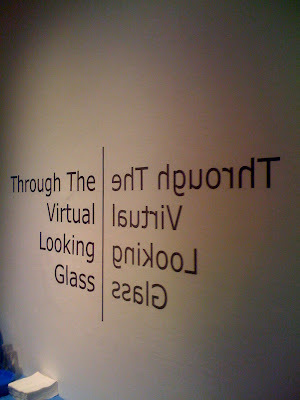 It’s an appropriate venue to show virtual world art, this gallery with its pioneering backdrop. We saw the organizer, professor of philosophy and director of the Virtual Art Initiative, Gary Zabel (Georg Janick in SL), buzzing around the gallery in full curator mode, greeting guests, checking on artworks, and glancing over at the crudités. He welcomed us with an engaging conversation about each artist. I was immediately drawn to a small work in the corner of the gallery, a photograph printed on canvas depicting a lovely Maxfield Parish styled installation I’d seen in-world. I was delighted to meet the artist Alizarin Goldflake (Martha Jane Bradford) who patiently explained her technique for making digital drawings, captured in Second Life and exported onto canvas. The texture of the canvas exuded warmth, in contrast to the giclée prints nearby by Bryn Oh and Feathers Boa, which illustrated darker subject matters. Zabel has brought together a well rounded combination of formats; prints, photo frames with rotating digital stills, machinimas and the real life counterparts to Second Life creations, such as the Mayan styled imagery of Big Psomm 2, painted onto wall sized tarps, sent from Poland by Piotr Kopik (Olza Koenkamp) and the tangled telephone lines of communication from Misprint Thursday (Karina Mitchell) - “Just pick up the phone and call me” her installation seems to plead. One would have to know a little bit about Second Life in order to truly appreciate the work presented. An orientation to the medium of virtual world art making would be helpful to non-users. While most of the work stands true on its own, it is the process of mixing mediums and realities that make these creations especially compelling. Blogger giving me trouble with photos - see the exhibition here and here.